Guillaume Faye was long associated with that school of thought, which, in 1978, the French media labeled ‘la Nouvelle Droite’ — though it was Right wing in no conventional sense, representing, as it did, the distinctly postmodern cause of ‘European identitarian nationalism’. Not to be confused, then, with the various neo-liberal, implicitly Protestant, and market-oriented tendencies bearing the same designation in the English-speaking world, the French New Right grew out of GRECE (the Groupement de Recherche et d’Etude pour la Civilisation Européenne), an association formed in 1968 by various anti-liberals hoping to overcome the failed legacies of Pétanism, neo-fascism, Catholic traditionalism, regionalism, colonialism, and Poujadism — in order to resist the cancerous Americanization of their homeland. To this end, GRECE’s founders believed they would never overthrow America’s liberalizing hegemony, as long as the general culture remained steeped in liberal beliefs. In the formulation of its master thinker, Alain de Benoist: ‘Without Marx, no Lenin’. That is, without the ascendancy of anti-liberal ideas in the general culture and thus without a revolution of the spirit, there would be no viable movement against le parti américain. GRECE was established, thus, not for la politique politicienne, but for the sake of metapolitically rearming European culture. And in this, it was not unsuccessful. For GRECE’s philosophically persuasive revival of anti-liberal thought and the subsequent affiliation of several prominent European thinkers to its banner made it an influence of some immediate import. Indeed, it can almost be said that for the first time since the Action Française, ‘Rightists’ in the ’70s achieved a level of sophistication and attraction nearly ‘comparable’ to that of the Left, as France’s ‘intellectual right’ threw off the defenseless conservatism that came with Americanization to challenge the liberal consensus imposed in 1945. While still working on his doctorate in Political Science at the elite Institut d’études politiques de Paris (Science Po), Guillaume Faye began gravitating to GRECE. By 1973, he had become its ‘number two’ advocate, a role he would play until 1986. Like other Grécistes in this early period, Faye was influenced by those European currents that had previously countered the imposition of liberal ideology. Foremost of these counter-currents were the Conservative Revolution of the German 1920s (Spengler, Moeller van den Bruck, Schmitt, Freyer, Heidegger, Jünger, etc. ); the traditionalism of Julius Evola; the Indo-Europeanism of Georges Dumézil; and the heritage of pre-Christian paganism. Contemporary anti-liberal ideas in stream with these deeper currents — such as the ethology of Konrad Lorenz, the philosophical anthropology of Arnold Gehlen, or the illusion-destroying field of genetics — were similarly incorporated into GRECE’s anti-liberal curriculum. Faye, though, took to these ideas differently (more radically, in my view) than de Benoist — perhaps because of his earlier affiliation with the Situationists and the ‘aristocratic’ ex-Communist Henri Lefèbvre; more probably because of his apprenticeship with the Italian journalist, Germanist, and post-fascist firebrand Giorgio Locchi; and ultimately, of course, because of his specific temperament. Less prolific and encyclopedic than de Benoist, the younger Faye was considered by some the more creative (le véritable moteur intellectuel de la nouvelle droite). He played second fiddle, though, to the master, who seemed bent on blunting the edge of New Right radicalism. There was, as a consequence, a certain implicit tension between their different notions of the anti-liberal project. For reasons explained in the first chapter, Faye quit GRECE in 1986. During the next dozen years, he worked in the ‘media’ as a radio personality, journalist, and occasional ghost writer. The publication of L’Archéofuturisme in 1998 signaled his return to the metapolitical fray. At one level, this work accounts for the dead-end de Benoist’s GRECE had got itself into by the mid-1980s, suggesting what it could have done differently and with greater effect. At another, more important level, it addresses the approaching interregnum, endeavoring to ‘transcend’ the historical impasse, which pits the ever changing present against the heritage of the past, between European modernism and traditionalism. 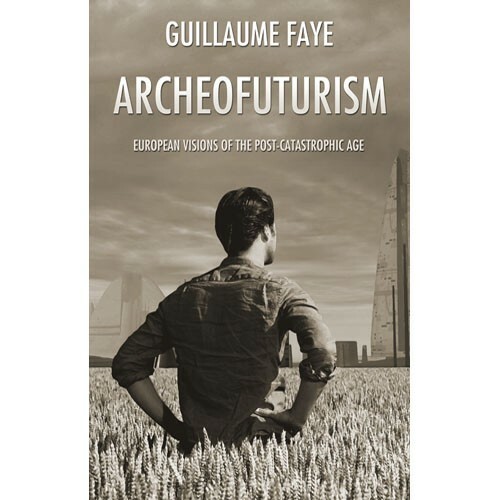 To this end, Archeofuturism calls for ‘the re-emergence of archaic configurations’ – ‘pre-modern, inegalitarian, and non-humanist’ — in a futuristic or long-term ‘context’ that turns modernity’s forward, innovative thrust (totally nihilistic today) into a reborn assertion of European being, as the temporal and the untimely meet and merge in a higher dialectic. Archeofuturism is thus both archaic and futuristic, for it validates the primordiality of Homer’s epic values in the same breath that it advances the most daring contemporary science. Because the Anglophone world outside the British Isles is a product of liberal modernity, the struggle between tradition and modernity, pivotal to continental European culture, has been seemingly tangential to it. This struggle, however, nevertheless now impinges on the great crises descending on the U.S. and the former White dominions. Faye’s Archeofuturism holds out an understanding of this world collapsing about us, imbuing European peoples with a strategy to think through the coming storms and get to the other side — to that post-catastrophic age, where a new cycle of being awaits them, as they return to the spirit that lies not in the past per se, but in advance of what is to come.